I made these for a party a while ago and they went down a storm. I was a little tipsy though and managed to burn my hand (on the oil) and mouth (by being greedy with hot food). They were pretty tasty though. Make the pastry sift the flour and salt into a large bowl. Add the oil and combine with your hands until it resembles fine breadcrumbs. Gradually add 185ml of warm water and combine to form a dough. Knead the dough for about 5 minutes. Cover and set aside for 15 minutes. Meanwhile, Cook the potatoes for 15 minutes until tender. Drain, cool and cut into small cubes. Cook the peas for 2 minutes in boiling water. Drain and set aside. Place a dry fryin pan over a medium heat and dry roast the cumin, coriander seeds. Grind in a pestle & mortar or spice grinder into a fine powder. Heat the oil in the pan and fry the onions over a medium heat for about 4-5 minutes until soften and lightly browned. Stir in the spice mix, turmeric, garam masala, potatoes, chilli and ginger and stir gently for 1 minute. Add the lemon juice and a little salt & pepper to your taste. Add the coriander leaves combine gently. Remove from heat and cool. Roll out the dough on a floured surface quite thinly (about 3mm). With an 8cm circular cutter, cut out about 30 circles. Spoon about 1/2 tablespoon of filling into the centre then with a little water moisten the edges. Bring the edges together to form semi circles and press together using a fork. On a floured plate, arrange the samosas and cover until needed. Heat some oil in a pan (about 10cm depth). 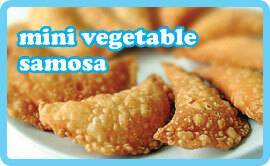 Drop each samosa into the oil and cook until each is browned on both sides. Drain on paper towels. You can fry before needed and serve cold, or heated in the oven for 10 minutes at 150ºC. Serve with tasty raita to dip them in. TIP: You can prepare them up to the point of frying and freeze for up to 3 months.